Hello guys ! Today we have a nice trick that name is How To Create A Yahoo Account Free. Yes you can create a yahoo account free. We had post a trick about yahoo and that is create yahoo mail account without number. You can also read that post by simply click here Create Yahoo Email Without Phone Number. As we know that yahoo is a very common name to all of us. It is a search engine name and also a name of email. 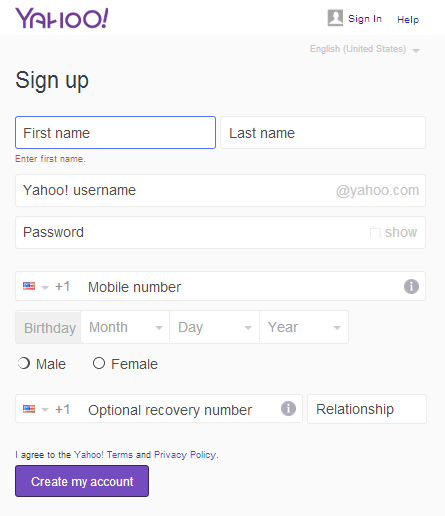 Yahoo provide us to create a free account on it. We can easily use it in our daily life. Most of our people known that what is yahoo mail. On our business site it helps us a lot. We can share an information by world wide within a second. Nowadays mail is very popular to all of us. So friends, let’s find it out how can we open a free account on yahoo. You very easily can registration for your Yahoo mail. Firstly you need to go to Yahoomail.com. Now you can see a yahoo registration page. Now Enter the details in the required field. Create a secure and strong password. Click create account button shown below the registration form. Now as in order to validate the registered login id, verify the registered phone number. You can select the option for send SMS or call. Submit the code sent to the phone number through SMS or as provided on a phone call. Now you can enjoy the yahoo email account is successfully registered. By doing this task you can create a yahoo mail account freely. You should open an email account cause it is very necessary to all of us. You can share your valuable think with anyone. If you want to do anything in this internet world you must need a email address. Otherwise you can’t do your important things. This is why all of us need to create a email account. Hope you like our post. If you, then comment us. If you want to give us your valuable opinion then click here. Stay with us to get new tricks. Till than be well.